Awesome ladies that actually HELP YOU !!! So far so good! Nice people! One line answers and repeating the questions over again. You need points to ask questions. App is not that intuitive. Anyone can say they have abilities. I am sure some of them are real but the responses are vague. They really did not know anything. I thought the readings were great an I'm looking forward to more!! There is only 1 great psychic on this site and the rest are bad! Not to mention they take what credit you have and don't refund you even after a complaint was given! You shouldn't have all credit taken away from doing an upgrade! I love this app, I ask questions and always get an answer and so far have not been disappointed. Also love love the horoscope feature. I love these ladies. They really speak the truth. Great app! Autumn is the best, she is very accurate and has great advice! She is always quick to respond, I recommend her all way! I love this app! Be careful though it can be addictive. Also, it may be tempting in the beginning to try them all out but if you get one or two or three ( at most) you connect with don't stray from that. Every time I did I was disappointed. I love Caroline, MysticMoon, and Mystic Tara. However, I'm sure more out there are great. I don't know what people are complaining about? The psychic told me stuff about my life that I didn't even mention to her and was spot on. I recommend ladylahni. Not only does she go above and beyond with her reading but she doesn't talk about what card she drew and let's face it , no one wants to hear that.give it a shot! You'll be addicted fast! I spoke to a fake psychic, who said an old friend will call me Sunday evening, which never occurred. Your lucky, if you find a real one! How do you view messages???!!! Sent a message still no reply 3 days later!! If you want insight then thus isn't the place to go. If you want to know the obvious that your grandmother could tell you then this is a great app. I'm glad there this review page cuz I was interested in this app but based on what iv been reading I'm going to save my time n money. Great idea, but the advisors do not come back with answers very fast or you use up money answering their questions about birth dates and such. No way to delete messages either or rate the advisors. Right direction, needs work. I have enjoyed this app. Anjelica is the best of the bunch and I have appreciated her insights. She actually does channel Spirit and has given me some incredible readings that have been spot on. Her phone readings always give me chills because they are so accurate. She also is very prompt in texting back. Totally recommended. My issues with this app is you buy points you ask questions takes 50 points. 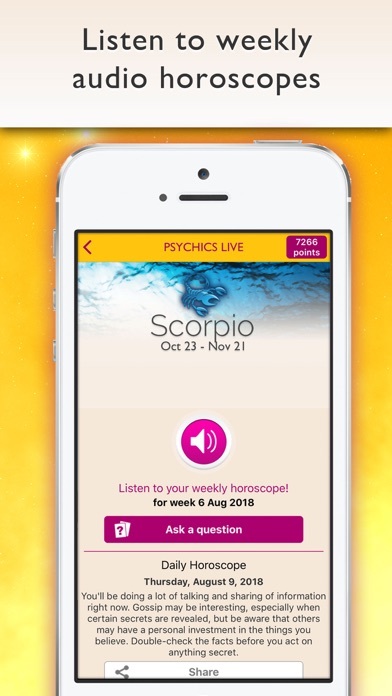 Well the some psychics will text back asking u to allowed them to do a extended reading which takes over 1000 points be while they took your 50 points without answering your question. Stomi, Phoenix, Tara folen are the best they wont spam you out of points. I love this App. I have a favorite, and she has been on target so far, helping me through my divorce. Give them a try! There isn't any consistency and the answers are not always correct. I would say to stay away from PsychicSunn. She is VERY rude, mean & has no compassion at all. MysticTara was amazing. She has a very calming voice that allows you to leave the reading with a feeling of peace. She doesn't sugar coat the reading. She gives you good & bad and it was great!! The horoscope daily reading is what I read the most on this. The colorscooe is interesting. The personal reading from different psychic is ok.
She answers like a robot and doesn't answer your questions. When asked again, she has the nerve to just repeat herself with her usual canned answer, which doesn't even relate to the questions. Do not use her! Some are actually great like Coraline! How would I become a psychic on there? Depends who you get. Mystic Tara, Caroline, Autum are pretty legit. They accurate and they give a full quality reading worth your money and time. I have tried all three and they have actually said similar things. It's crazy. The site over all is ok. They have a colorscope and horoscope. Please don't talk to a psychic thru your card. Do points they are cheaper. Was given answers that were irrelevant and insulting and completely FALSE. Person on other end completely made things up that had nothing to do with what I was asking. This app is horrible. The so called psychics respond when they feel like it and some dont respond at all. This app it terrible do not waste time with it. Not worth spending your money. Program is easy to use... Sometimes it takes a while for them to answer back. Or they ask you to be more specific and then that's more money its costing you.. Terrible app. Please do not spend your money. Readers only answer your question with another question. Cold readings, & not authentic. The psychic I talked to, Mystic Tara is so right on!! I loved talking to her! I definitely recommend her & this app!! She was amazing! 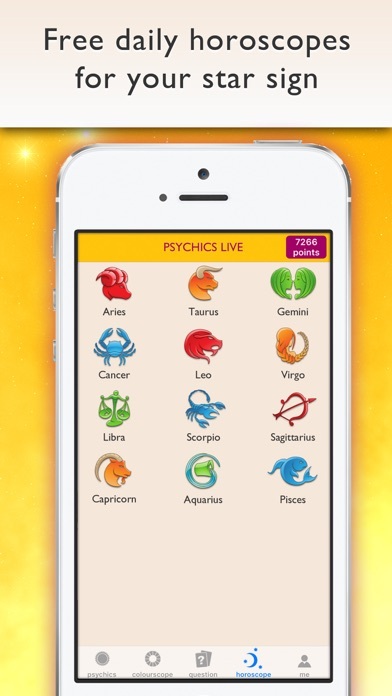 It's a great app once you finally find that true psychic that is not only connected with you but is a REAL psychic. A few hit and miss and wasted money but found a few that are always accurate. TIP: a real psychic won't ask too many questions and give you an exact date and time. Another great reading from Mystic Tara! I can get answers to my questions, right in the palm of my hands. Mystic Tara was able to see my situation. And gave me great insight and clarity. Terrible! 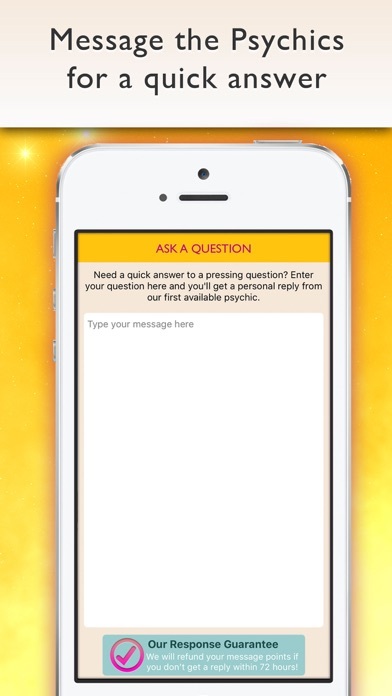 Seriously you spend money and these psychics don't answer any of your questions and just work around your question. So far waver ground they said either is a lie or hasn't come true. They don't know what they are talking about. I myself am a skeptic, but a lot of the answers I was given were dead on. Or at least close enough. I figured I'd try it I never did anything like this before. Most of the answers you get really do help to put your mind at ease. I've never called, just used the message feature, but when I was going through a bad breakup once the answers I got to my questions were comforting. 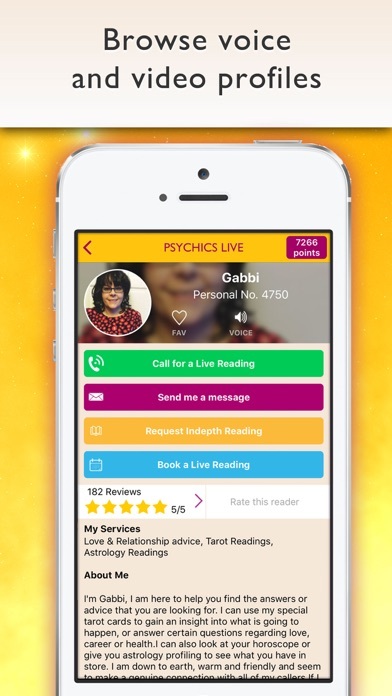 great psychic's and really true to their word! highly recommend this app! I had a problem with the app and they were quick to respond to me and was able to resolve the issue quickly. They were polite and prompt. I wish all customer service would be like the owners of this app. As far as the psychics go, it's trial and error to find one you click with. I just do the written readings. I haven't done any phone readings. Kenny is a sweetheart, kind, understanding and funny. NOT SURE, BUT, when some of them r online , they r under a diff name than when I had asked them questions earlier, weird! Some r gone, skeptical of some of their answers😬 . They all basically can give u answers but a few prob. r legit. Great reading! Very accurate and I will be calling her back! She was dead on and wouldn't let me tell her anything in advance. If you're wanting an authentic reading call her. You won't be disappointed. Be very cautious with this site there's a few very good psychics on here however most can take close to three days to respond and if they failed to respond you are promised a credit and when you request that credit what winds up happening is they withdraw 50 points instead of crediting you. There is many glitches with this app again you need to be cautious if you type in a message often it will go ahead and send it before you get done typing it losing another 50 points. Their customer service is terrible they will do anything to get out of crediting you and request that you take screenshots etc. and will threaten if you don't have that they will not respond. 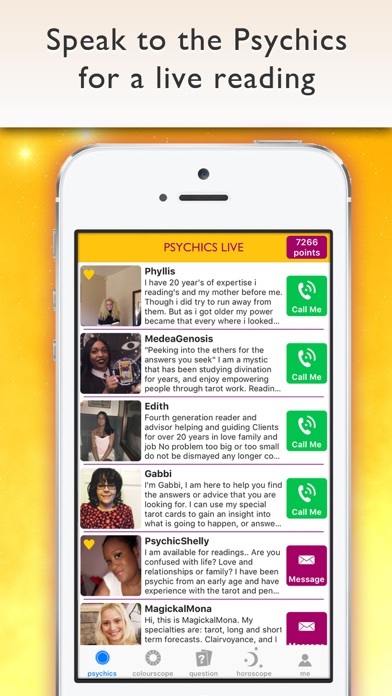 It's a shame because there's a few good psychics on there but unfortunately their customer service is a scam! I spoke to Phoenixia, and I highly recommend her. She was awesome and very accurate. I'm rating the experience a five because of her excellence. Warning, if the psychic is on the phone with someone else, do not put yourself on hold because you will lose minutes holding. I lost 6 minutes waiting for her for five minutes and one minute from waiting to be connected to her. I will call her again when I need a reading. I enjoyed the experience once I got on the phone with her. I asked 4 different psychics the SAME EXACT question. Every single one came back with completely different responses. Coraline is awesome... She is on spot! Worth it!!! !